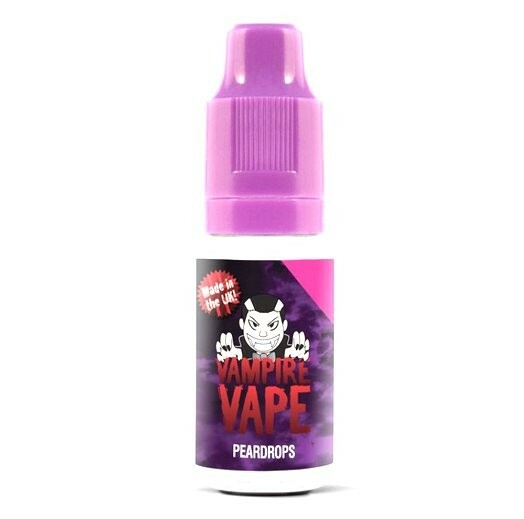 Vampire Vape Pear Drops e-Liquid | Electronic Cigarette Co. The taste of the classic pink and yellow boiled sweet. Mouth-watering juicy pear with a sweet kick. You're advised to use a glass tank with this juice. Nicotine levels 0mg, 6mg, 12mg, and 18mg are 60% PG, and the 3mg is a 50% VG blend. The 50% VG e-liquid is best with standard coils with a resistance of 1.0Ω through to 1.8Ω, as a general guide. The Ω is often written on the heating coil inside your tank if you're not sure. This juice blend is quite smooth and will usually provide a medium amount of vapour but less flavour if you're not able to vary the power output on your device, so if you have a 1.8Ω coil in your tank (for example) and you want more flavour, you may want to consider a 70% PG blend which will usually provide more flavour but less vapour. The more PG usually the more flavour but a bit more throat hit. See our page e-liquid blends if you want to learn more about thicknesses and PG / VG ratios. This will also explain about the nicotine strengths, vapour production and throat hit. 1 x 10ml Vampire Vape Pear Drops e-Liquid.